Before we get into helicopter tugs: What type of helicopter uses wheels? This begs the question: what type of helicopter uses tires and struts for a landing gear rather than the traditional skids? Or more specifically, is there something in particular that distinguishes which landing gear they are equipped with? Wheels are used without exception on all medium and heavy helicopters for a few reasons. First, as a helicopter gets heavier and heavier it becomes increasingly more difficult to take off vertically, especially at max gross weight. Riding on tires allows it to run up for take off providing increased lift during take off. It is still much easier for a helicopter to hover vertically than take off vertically. Second, skids are a very simple, very light landing gear configuration which is strong for its size and mass, but it has limitations. It cannot replicate the strength of a pneumatic strut with tires that you find of fixed wing aircraft. The level of difference or difficulty in towing a helicopter versus an airplane is mostly contingent on the landing gear configuration of the helicopter. Wheeled helicopters are mostly configured in the traditional tricycle gear of an airplane, but there are a few exceptions. Some medium-lift helicopters, such as the Sikorsky H-60, use a tailwheel configuration, and the Boeing Vertol CH-47 utilizes a quad-gear setup. Those two latter helicopters listed are not the norm; tricycle gear configuration are the most prolific configuration in wheel helicopters. A tricycle geared helicopter is towed the same way as a fixed wing airplane of similar size. In fact, it could be simpler since some helicopters are equipped with folding rotors allowing for a much more narrow profile. Specialized helicopter tug, or share equipment? There are no particular special requirements for towing a tricycle-gear helicopter as opposed to a tricycle-geared small jet or turbine fixed wing aircraft. The gear are in roughly the same locations and configured the same way. There is no reason to double up on expensive ground support equipment when one piece of equipment will do both jobs equally well. The M-Series and the Twin Series from Mototok are built for aircraft all the way up to 75 tons so they will tow even the largest helicopters in the world with ease should the need arise. The Mototok tugs can be used on either tricycle gear helicopters or just as easily adapted to the large tailwheel helicopters by cradling the tailwheel. Other than the mounting location, there is no operational difference between moving a tailwheel or tricycle-gear wheeled helicopter. You get the same precision movement regardless of landing gear configuration. What obstacles exist in using an AGV over a traditional helicopter tug? Since AGVs are so naturally user-friendly, it is hard to imagine an obstacle in transitioning from a traditional tractor tug to an AGV. The most difficult hurdle in the process may very well be just shifting the mindset of the end users who have relied on cumbersome tractor tugs for their entire careers. It should take only one experience with an AGV to easily shift that mindset. They are virtually silent, simple and intuitive to operate, and are built with tremendous safety features. AGVs also can maneuver in a way that could never be replicated by even the most experienced tractor tug operators, and done so with a relative novice using the AGV. AGVs transition seamlessly from aircraft to aircraft without any adjustments being necessary, thanks to the unique cradle for the tires which securely clamps and lift the landing gear creating a completely secure mount. As it stands, there does not appear to be any downside to using an AGV for wheeled helicopters. One of the most common applications of wheeled helicopters is sea-based operations, whether on offshore oil and gas rigs, or seafaring vessels. With these space is always at an absolute premium, and the conditions are usually difficult with salty air, extreme temperatures, and pitching, unstable landing and parking platforms. Mototok tugs are sealed units which ensures that they will work when you need them to work. There is no need to keep a separate fuel supply on hand for an electric tugs; just an open power receptacle. They take up no space in addition to a helicopter as they can be left underneath the aircraft when it is not in use. 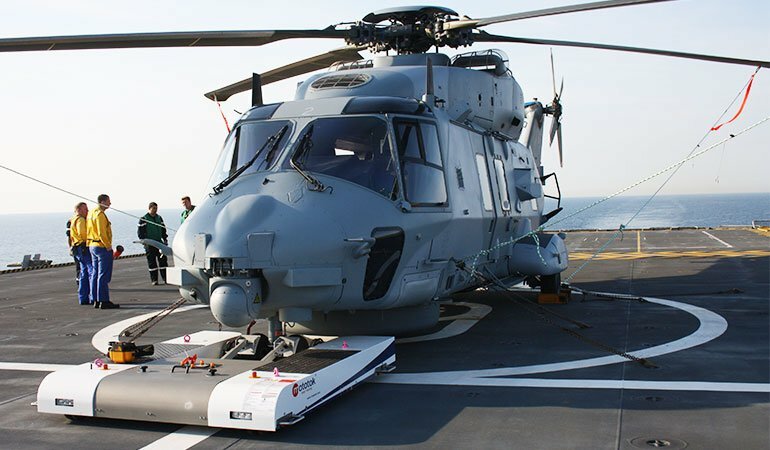 What helicopter tugs are on the market for wheeled helicopters? Since wheeled helicopters are usually on the heavy end of the helicopter spectrum, they have traditionally been supported by the same sort of tugs which are found moving medium sized fixed wing aircraft (Beech 1900, Fokker F-27, etc). But the advantages which helicopters provide, namely vertical lift, decent, and takeoff, allows them to operate in areas which fixed wing cannot. A tractor tug work suitably on large areas of flat surface which is what airport aprons are, but they are woefully lacking on a small helipad of an offshore rig or a ship. There are a handful of walk-behind and ride-along electric tugs which can work for wheeled helicopters but only Mototok provides such broad diversity. We are the only manufacturer where a tug made to handle a Boeing B737 BBJ can immediately turn around and tow a Sikorsky S-76 with no modifications. Also, a walk-along tug is not the same as an AGV; the remote control of the AGV allows full 360° visibility of the operator and allows him to move to any position around the aircraft during the operation. A walk-along tug still requires the use of additional personnel as spotters, particularly in the tight quarters of an offshore rig helipad. How can implementing an AGV helicopter tug help your operation? Such helicopter tugs are an excellent addition to your ground support fleet. Perhaps addition is not the best choice of words though; the thorough modernization of your fleet may be a more apt description. Extreme, tight quarters is one area in which AGV technology really shines. The operator can build in specific parameters for the unit which it will not cross. This is a potentially life saving technological advancement, and certainly affords the potential to save an aircraft. Imagine, for instance, being able to set movement restriction areas on a confined area like a helipad on an oil rig. Also, AGV tugs have a very positive locking brake system which is incredibly quick in reaction and stopping power in comparison to traditional hydraulic braking systems on tug. When the operator brakes the system, it comes to a stop instantly. The learning curve and ‘comfort curve’ are much, much lower on an AGV and remote tug as opposed to a tractor tug, particularly in confined areas like oil rigs and ships. For one, the operator is not strapped onto the tug so if something catastrophic happens, he is assured that he will not be going overboard with the tractor, let alone the aircraft going over, too. It is the time to let technological advancements work for you in the aviation ground support industry, whether your business is skidded helicopters, wheeled helicopters, fixed wing aircraft, or all of the above. Modern advances in technology allow amazing, powerful, compact, user-friendly, and most of all safe machines to conduct aircraft ground movements with ease and confidence. Contact Mototok today to see which product is the best fit for your operation!